We have EVERYTHING you need to build your holsters. If you’re looking for holster making supplies then you know how cool of a feeling it is to create something with your own two hands. In this day and age, everything is pre-made and available to be shipped to your door in 48 hours or less. Drive thru restaurants mean you can get a meal in just a few minutes. The internet makes it easy to Google a question and have an answer in seconds. Really, ordering a holster is easy. If you have a vague idea of what you’re looking for and you read some reviews, you can get a holster that fits your firearm and that will serve you well. But you know, there’s something really amazing about sitting down and making a holster with your own two hands. Are you the type of person who appreciates learning about how things are made? If so, making a holster might just be up your alley. Do you enjoy the wonderful feeling you get when you’re doing something you love for yourself? Once again, making a holster for your firearm might be for you. There’s a wonderful TED Talk from Simone Giertz about the importance of making useless things. In it, she talks about her first invention, a helmet that brushed her teeth for her, as well as how it inspired her down the road to creating other robots like her drone that gives hair cuts, her face-slapping alarm clock, vegetable chopping device. On the topic, she had this to say: “I’m not an engineer. I did not study engineering in school. But I was a super ambitious student growing up.” The end result? Making things for the sake of making them. The takeaway? There’s a joy in creating something with your own two hands even if it isn’t perfect. Would We Recommend Holster Making? Absolutely! Okay, admittedly we’re a little bit biased as holster makers ourselves, but we do think that if you’re even remotely interested in the process, it’s absolutely worth learning more about. Whether you have some experience making things and your friend asked you to build a holster or you’re simply interested in being able to craft the perfect holster for your specific needs, you’re in the right place. 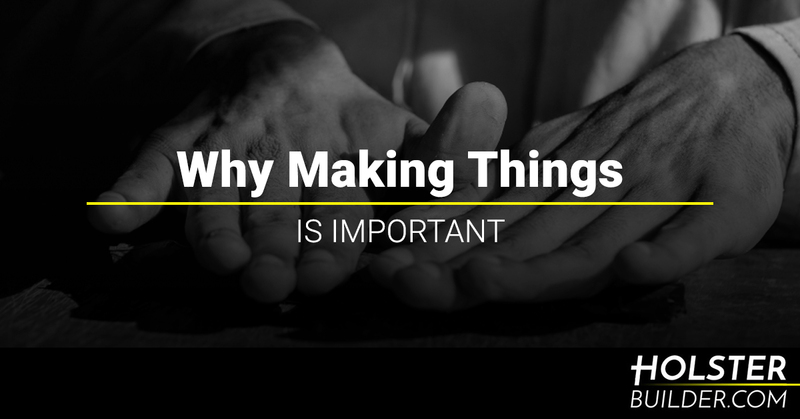 So would we advocate for making things? Absolutely. Whether you’re interested in woodworking, computer building, sewing your own clothes, or anything else, this world needs more people who don’t mind going the DIY route. Of course, if the thing you decide to make is holsters, you’ll need holster making supplies, and you’ll find them here at Holster Builder. Take a look at our online shop to put together a holster that you’ll love for many years to come, and if you have a question, don’t hesitate to reach out because we’d be glad to help!